*'The Violent Death of the King in the Car Park'. Talk by Bob Woosnam -Savage Royal Armouries, Leeds, Wednesday 27th March 2013. It's my great pleasure to start the first indieBRAGTM blog tour by hosting an interview with fellow indieBRAG HonoreeTM and re-enactor, Paula Lofting, author of ‘Sons of the Wolf’. 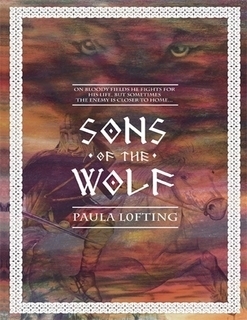 Hi Paula, I believe this is your first novel; why did you decide to write ‘Sons of the Wolf’? Hi Su, let me start by thanking you for agreeing to host me on the opening day of my blog tour. It’s great to be here, especially on your fantastic blog. I’ve been an admirer of your work for some time! Well, to answer question number one, it had always been my dream to write a novel of some sort ever since I was a kid, daydreaming in my composition class at school. I never could write short stories, I was only able to write ones that went on forever and I struggled to get them finished. My mind was like woven cloth, with so many threads running through it. Sons of the Wolf was a late inspiration, mainly because throughout my life, the dream became a distant memory as other paths took me away from what I had always wanted to do. Life does that sometimes. Later, I found myself re-evaluating life after a marriage breakdown and some really dark times. I started reading again and the urge to write gnawed and nibbled at me until I just had to write that epic novel I was always meant to. That it would be historical fiction was a given. After perusing with ideas and eras, I was finally inspired when I watched a re-enactment of the Battle of Hastings, and when I stumbled on a book by David Howarth’s 1066, The Year of The Conquest,I knew I had my story. Although ‘Sons of the Wolf’ is a work of fiction it is based on historical fact. How did you go about researching it? After I had decided on my subject, I started researching articles about the 11thc on the net and stumbled across www.regia.org website and found that apart from some really interesting, useful articles, they also did living history and battle re-enactment and thought that it would be a wonderful way of learning firsthand what it was like to live a thousand years ago in England. I contacted them and found that they had a group in Sussex where I live. Having joined them, I now realise that the enjoyment of re-enacting far outweighs the enjoyment of the research aspect. It’s a great life and I wish I had joined earlier. For the events and politics of the time I read widely and look for primary sources to ensure as much accuracy as possible. Do you feel any responsibilities as a writer of historical fiction? Definitely. Everyone hassomething to say about this don’t they,J.I know that there are lots of authors and readers who are not too fussed about historical accuracy and that’s fine, but for me, it wouldn’t feel right if I didn’t at least try to stick to the facts as far as I possibly can interpret them. I wouldn’t feel comfortable with changing or making up facts to suit my story and I wouldn’t want to attribute good or bad deeds to a historical figure if it were not true. What can a modern readership learn from the hardships of Wulfhere and his family and the Anglo Saxons in general? Probably the first lesson would be not to take for granted our nice cosy lives and to appreciate and respect our ancestors for paving the way for us. If not for their hardships, we would not be the people we are today. It was a hard cruel world, for both the peasants and the nobility. Families like the Wulfheresons from my story, enjoyed the comforts of plenty of food, servants to help them, decent clothing and a great hearth to warm their home, but they still endured hardships such as having their crops ruined by weather; damp, cold drafty rooms; illness and untimely deaths caused by something as minor as a witlow on their fingernail; death in child birth; invading marauders; it often made no difference what your status was, it was a hard life for everyone, though much harder for some others. No soft toilet roll to use in a nice flushing loo; no antibiotics to cure your infections; shivering in long cold winter nights. Wulfhere might have been a thegn (a low-ranking noble) but he still would have had to chop wood for fuel, work hard mending bridges and fencing around the King’s demesne as well as maintaining his own buildings. His wife Ealdgytha would have spent her day spinning wool, weaving cloth or sewing clothing for her family. She would have had to see that everyone was fed and watered and oversee the work around the home and make sure the farm ran smoothly. I think we also take for granted today that we have the potential to live long healthy lives, in medieval times, if you survived past 5 years old, you might be lucky to live till you were 25, perhaps less if you were female, with the chance of dying in child birth. I could probably go on forever! I’m currently working on the sequel to Sons of the Wolf, The Wolf Banner. It follows Wulfhere’s fortunes further and leads us closer to the Battle of Hastings. It also continues with the fortunes of the historical characters of that time too. And finally, where can readers learn more about your work? And 'Sons of the Wolf' is also available from Amazon in both the UK and US. Thanks Paula, it's been great to chat with you! IndieBRAG: Your source for quality self-publishing.